Your tour starts in Italy where you’ll visit the gorgeous cities of Venice and stay in nearby Mestre. Staying in the Russott Hotel, you’re only a short drive from the city of Venice. With only one night, time is limited, but you’ll have the morning to explore Venice on a walking tour. While in Venice, walk along the banks of the canals and witness the gorgeous Venetian buildings lining the waterways. As well as the breathtaking Grand Canal and Piazza San Marco, highlights of Venice also include St. Mark’s Basilica, and the Gothic masterpiece: Doge’s Palace. Staying in the popular resort town of Bled; you’ll have ample time to explore the sights of Bled and nearby towns in the Julian Alps. Your first day in Slovenia includes a relaxing boat ride on Lake Bled – one of Slovenia’s most popular destinations. Only 2km x 1.4km, with its charming turquoise water, Lake Bled is a picturesque sight to behold and creates a beautiful backdrop for walks along the shore. During summer, due to the mild thermal springs, you can enjoy a relaxing swim in the lake. You’ll also visit the historic Bled Castle, from where you can witness stunning views of the lake and surrounding mountains. You may think it doesn’t get more spectacular than Lake Bled, but just wait till you see Lake Bohinj – one of the Bohinj region’s best-kept secrets. What sets it apart from Lake Bled is the lack of crowds and more peaceful vibe. People mainly come here to relax and experience the scenery or to swim in the crystal-clear water. The lake’s location allows for laidback bike, walking and horse riding trails as well as adventure activities like hiking and kayaking. The Postojna Cave is one of the largest and most impressive cave systems in Europe. Filled with stalactites, stalagmites towering mountains, shallow rivers and vast underground halls, as well as underwater cave creatures aptly named “baby dragons”, the Postojna Cave is a place like nowhere else. Only a few kilometres from the Postojna Cave, lies the Predjama Castle. This medieval castle built within a 123m high cliff over 800 years ago features a series of hidden tunnels behind it from where the one of the nights of Predjama would set out on expeditions and to meet his secret lover. The castle and tunnels are an adventure to explore and really take you back in time. With only one day in Austria, it’s hard to find the time to see everything this beautiful country has to offer. Your trip to Austria includes a panoramic tour of the breathtaking holiday destination, Lake Worth. A gorgeous lake surrounded by beautiful palaces and villages built in the late 1800s and early 1900s. From Lake Worth, your exploration of Austria continues to the charming University town of Klagenfurt. Founded in 1246, this gorgeous town is filled with history and charm. With everything form museums and galleries to restaurants and bars as well as markets and a spectacular countryside for hiking and cycling, Klagenfurt has something for everyone. Your stay in Croatia begins with a tour of Rovinj. Venture down cobblestone streets and explore the quaint squares and villages. Perhaps what many people know Rovinj for is the towering church of St. Euphemia. Climb to the top of the bell tower and witness the most remarkable views of Rovinj and surrounding islets. A stay in Croatia is not complete without a classic tour of Istria. Indulge in truffle and olive oil tastings across the Istrian peninsula and visit the breathtaking Pula Arena ­– one of the last well-preserved Roman amphitheatres in Croatia. After a night in the quaint town of Porec, take a drive along the Adriatic coast to Opatija. This coastal town was once an exclusive resort for the elite but now boasts an array of beautiful hotels and villas open for everyone. While there aren’t any beaches, there are a multitude of sheltered bays perfect for swimming all year round. From Opatija, your Croatian adventure continues through the Gorski Kotar region where there’ll be time to visit the picturesque town of Fuzine, home to Lake Bajer, where you can enjoy various activities including boating, canoeing, kayaking and windsurfing. In addition, visit the Vrelo Cave – formed over 4 million years ago, due to its relatively not steep mild terrain this cave is the only one accessible to everyone including the elderly and those in wheelchairs. One of evidently many highlights of this incredible tour is the spectacular Plitvice Lakes National Park. This tranquil national park has an impressive collection of waterfalls, gallery of sixteen lakes formed by natural dams of travertine, and an incredible diversity of wildlife. 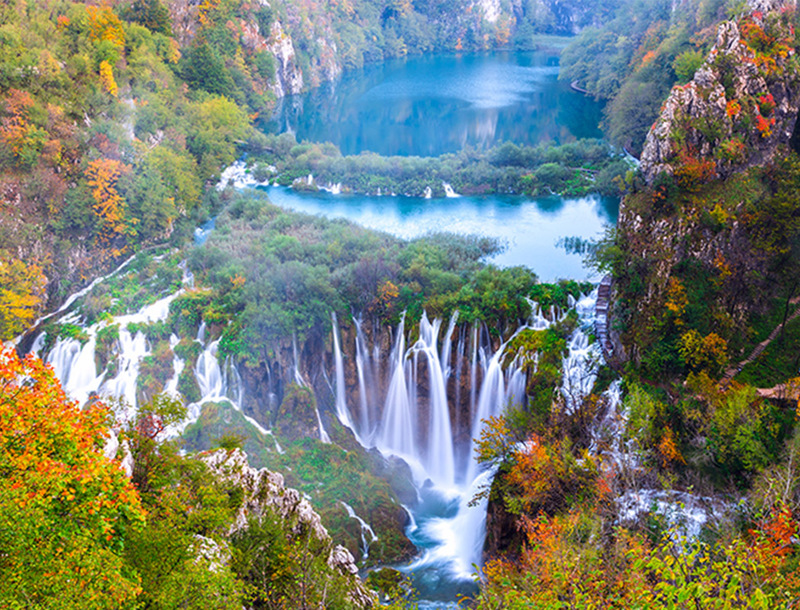 Unsurprisingly, the Plitvice Lakes have been on the UNESCO World Natural Heritage list since 1979. From Plitvice, the last stop on your Lakes, Waterfalls and Castles tour is Split. The perfect place to end such an incredible tour, the UNESCO World Heritage site of Split offers a range of historic Romanesque churches, medieval fortifications, 15th century Gothic palaces and other Renaissance and Baroque style buildings, creating an exceptional vision of historic culture and heritage. Each day on this tour is filled with new and wonderful experiences. Visit some of Europe’s most spectacular lakes, castles and medieval towns. Traversing 4 countries in only 9 days, why wait? Book your European escape today!